On the Scout 350 LXF, Mastervolt and Garmin pitch in to completely integrate all of the ship’s systems. 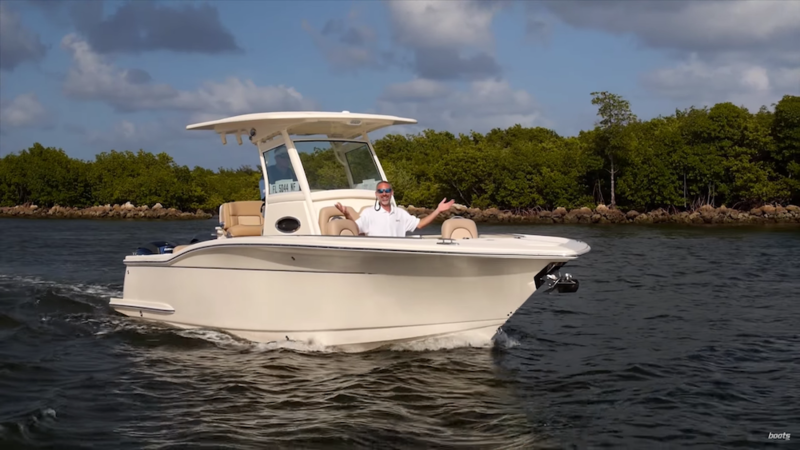 In our estimation, Scout boats has been on a roll lately: in 2012 they introduced the 320 LXF, which managed to mix fishability and family-friendly in a number of ways we haven’t seen before; then they rolled out the Sportfish 195, which has a hull so efficient it gets over 5.5 miles to the gallon at 25 miles per hour. Now consider their latest creation, the fully integrated 350 LXF. The Scout 350 LXF leads the trend towards fully-integrated systems, with a little help from Garmin and Mastervolt. No, the hull itself isn’t new—the big news here is how you control the boat. And we’re talking about all aspects of control. The electronics, all made by Garmin, follow that company’s latest trend in incorporating advanced integration with other parts of the boat. 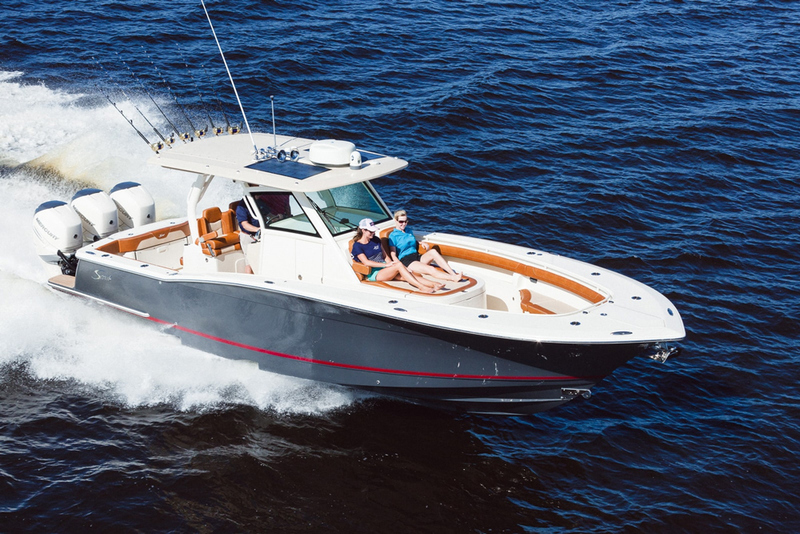 In the new Tiara Coupe 50, for example, you get Glass Cockpit, which ties the Volvo-Penta power system in with the electronic brains and incorporates items like autopilot, station control, and dynamic positioning, among others. 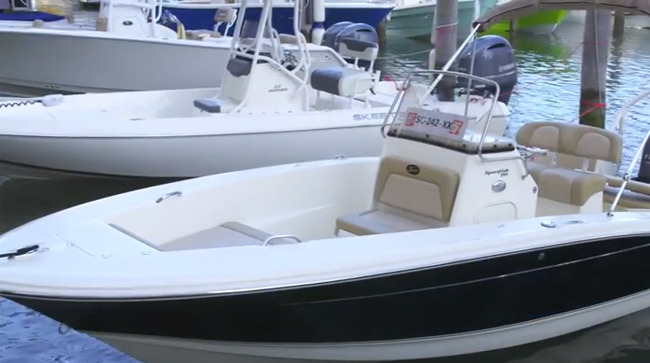 On the Scout—obviously a very different type of boat—all of the boat’s circuits and systems can be both monitored and controlled in the same way. To extend your control even farther, on the 350 LXF Mastervolt is also brought into the mix, via their CZone technology. CZone is a digital control and monitoring system that ditches a massive amount of wiring and fuses in favor of a NMEA 2000 network cable, coupled with an intuitive interface. What’s the net result of all this integration? Instead of reaching in one direction to control your chartplotter, anther to control your autopilot, and somewhere else to flip on a light switch or a livewell pump, it’s all right there, on one touch-screen at your helm. Better yet, you can customize your own interface. You want to see fuel flow? Yep, that’s accessible via the same screen, too. You want to activate or monitor the bilge pumps? No problem. You’d like to turn on the stereo? Of course you can do that without moving an inch from the helm. 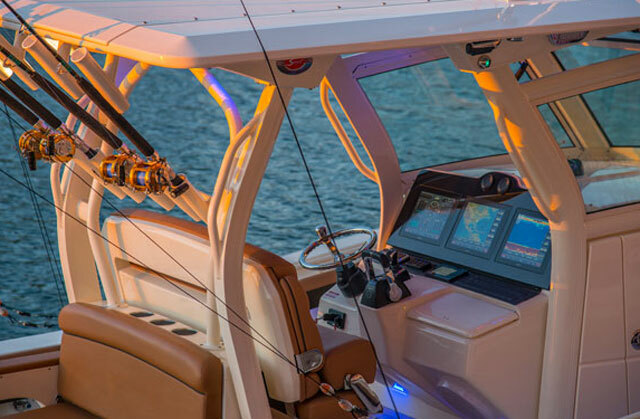 Aside from this new vessel integration, the 350 LXF is about what you’d expect in a monster center console built by Scout. 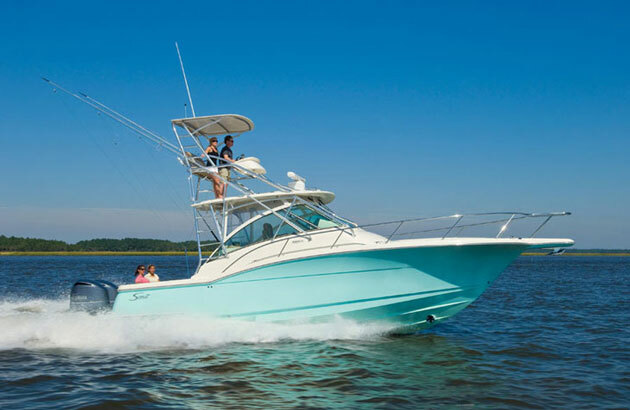 Like the 320 it blurs the line between fishing and entertaining, with perks like a mini-galley in the console (with a microwave, sink, and ice chest), a console berth, electric head, and an (optional) electric teak dinette table that converts into a sun lounge. On the fishing front, you get a leaning post livewell and tackle station, fishboxes in the deck and transom, and fresh/raw water washdowns. 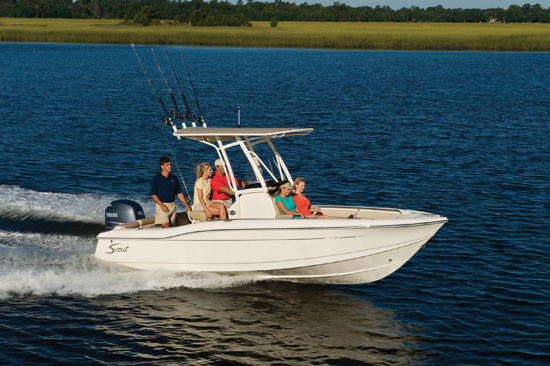 A mix of fishability and flexibility can be found on the 350 LXF. 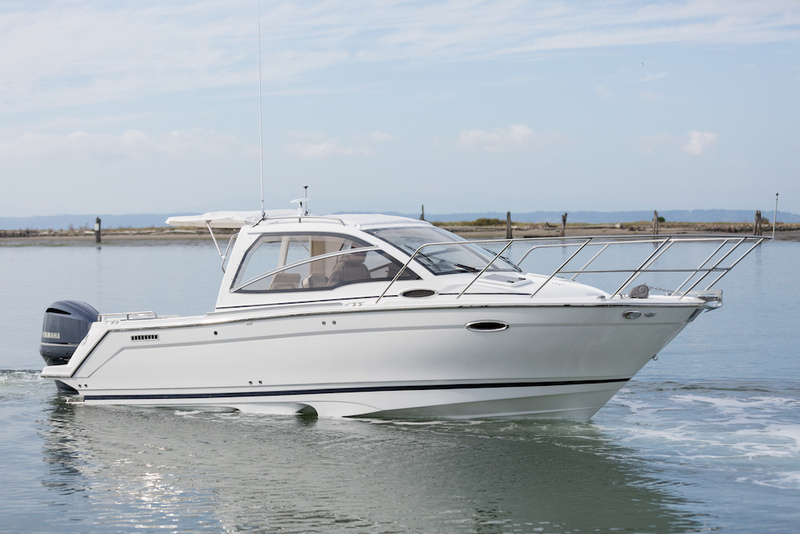 The 350 LXF is available with either twin or triple engines, though for many of us, three outboards will seem a bit excessive on this boat. Truth be told it does great with a pair of F350’s, turning in a top-end a smidge over 6o mph and a cruising speed of 42.3 mph. Do you really need to bump that top end up to 65 mph? Fine. But recognize that this will drive up cost, which is already a bit over $315,000 with twins. 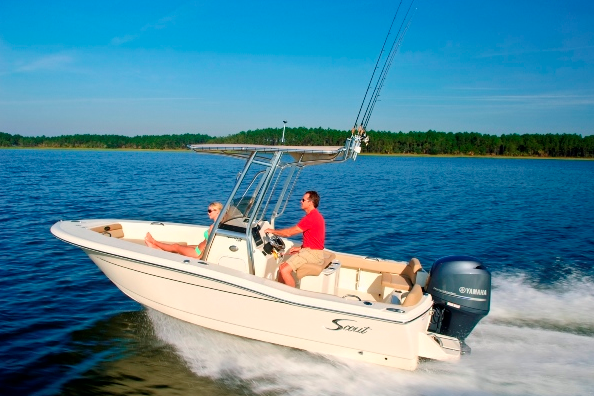 However you want the Scout 350 LXF rigged, remember: the real difference with this boat is integration. Thanks to the cooperation between Scout, Garmin, and Mastervolt, you shed wires, switches, and most importantly, complexity. Other Choices: When it comes to other big center consoles with completely integrated systems… we’re waiting. 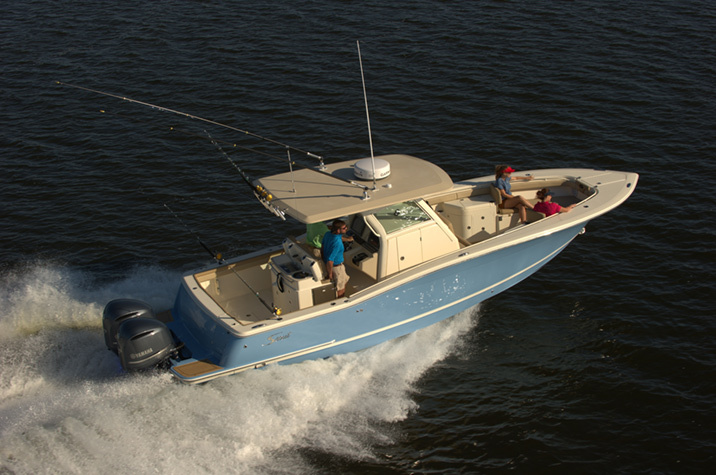 See Scout 350 LXF listings.